This section covers both English and foreign silver ranging between the early eighteen hundreds to the early nineteen hundreds, in the main, but with some late twentieth century nickel silver rests that will become the antiques of the future. There are also, where possible to be identified, some very famous and prolific manufacturers mentioned, where people only collect one specific maker. Extremely decorative and in excellent condition. Base has fluted edge with engraved detail within, centre piece heavily twisted. Thought to be 1920's and could be foreign solid silver. In good condition with clear marks. Beautifully engraved on collar and end piece with plain bases. Base has minor small dents and end of one "tooth" is imperfect but thought to be original not an accident. Small animal tusks resting in silver frames. Ivory centre piece with plain cross ends. Very desirable shamrock ends with mother of pearl centre piece.In perfect condition. Foreign solid silver with finely engraved ends. Letters CPH embossed in circles probably C. H. Peterson from Copenhaqen with the word SILVER also an added engraving. Grey/black natural stone (possibly marble) centre piece. Very heavy and solid with engraved centre piece. Solid silver with an "A" engraved in the centre of the star. Excellent condition. Very attractive in perfect condition with clear marks. Date: Believed to be 1833 of Austro Hungarian origin. 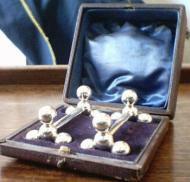 Very attractive but simple design typical of late Victorian era.They are in extremely good condition with clear marks. Very good condition attractive little rests with border engraving to base. Very ornate ends with deep twist centre piece,in perfect condition. Elegantly simple with centre piece shaping, in very good condition. In perfect condition in own purpose made box. In excellent condition with initials engraved each end. Maker: Charles Reily & George Storer. Pristine condition, attractive square shaped cross ends. Maker: George Jackson & David Fullerton. Motto " Non Sanz Droict" on dark blue enamel, shield gold and turquoise.It is known as Shakespeare's motto and crest meaning "Not without right". Attractive design of faux bamboo ends and middle section. Simple rests in good condition. Plain rests from George 3rd period in good condition. Excellent condition with engraved crossed flags at one end of each rest. Makers: Joseph Willmore and Yapp and Woodward both well known Birmingham makers.Both rests from William 4th. period in excellent condition for their age. Solid silver made in London 1818 makers mark G.K. Very ornate ends with a straight middle. Both rests from George 3rd. period in perfect condition.